Now that we are officially into summer season, it’s time to think about the bounty of summer fruit. 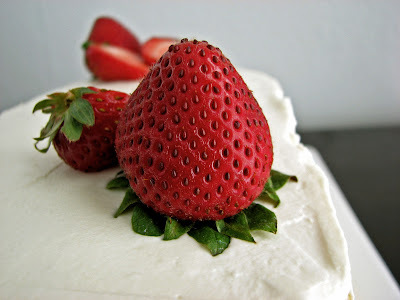 Strawberries always remind me of summer picnics and the fun of gathering with family and friends. 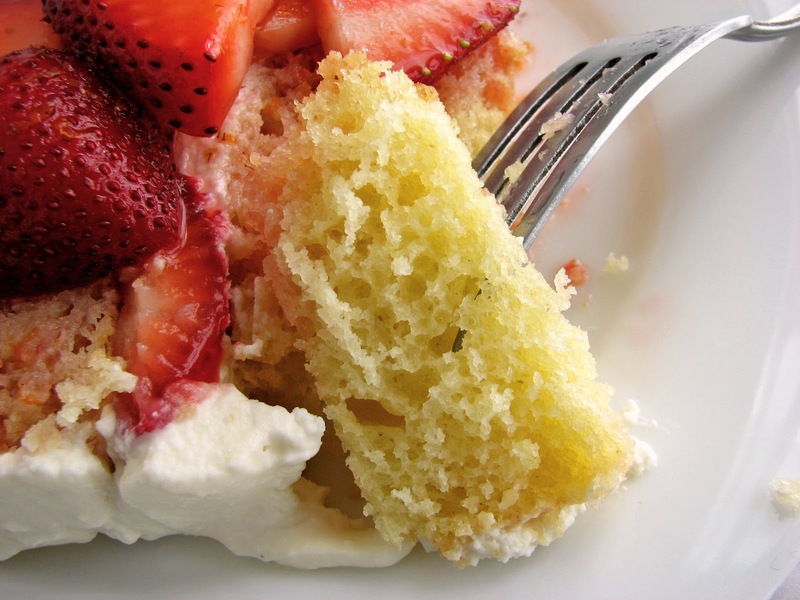 This is a little riff on Strawberry Shortcake with a bit of a Mediterranean flair. The cake includes just a smidgen of semolina to add a bit of edge to the texture. 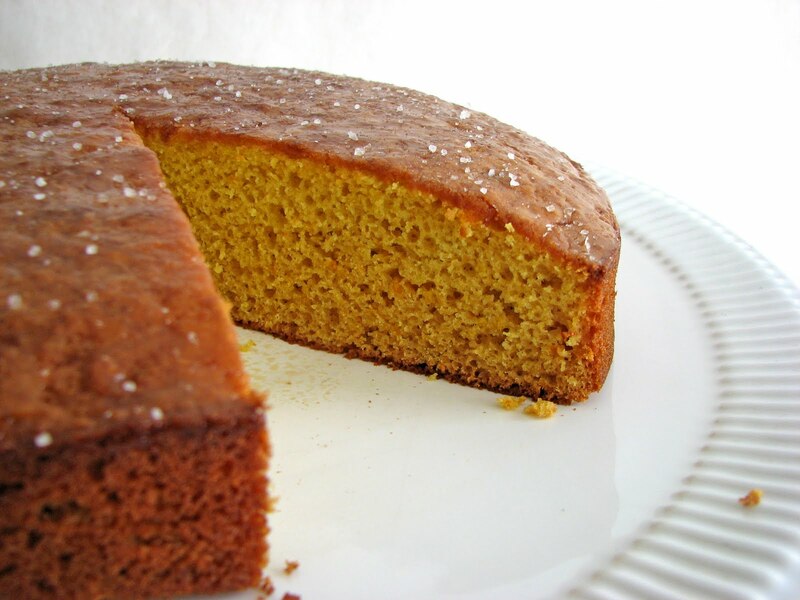 I use extra virgin olive oil to moisten and flavor the cake. It’s filled with fresh strawberries along with their delicious juices and finished with a cream that includes mascarpone and ricotta. It’s La Dolce Vita luscious. Just to complete the picture, I highly recommend serving with a glass of Brachetto d'Acqui or Prosecco. Here’s to the long and lazy days of summer! 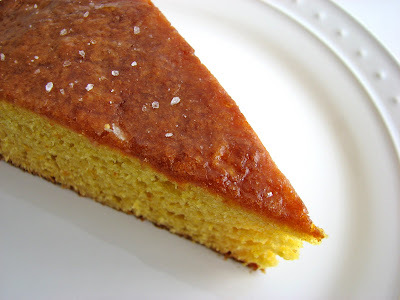 - You should be able to find semolina in bulk grocery stores. If you prefer to leave it out, just substitute flour for the semolina, totaling 1 1/2 cups of flour in the recipe. - If you can’t find mascarpone, you can substitute cream cheese. - Consider making homemade fresh ricotta. It's really delicious and worth the effort. All you'll need is milk, heavy cream, lemon juice, salt and cheesecloth, which you can find at most grocers and hardware stores. - I cut the cake in half vertically for height in presentation, but you can also just cut it in half horizontally, fill and finish. 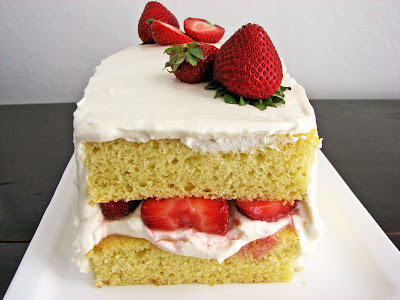 Or just cut the cake into square servings and dollop the top with strawberries, juices and cream. Preheat the oven to 350 degrees. Grease a 9” x 9" x 2” square pan. Line the bottom with parchment paper. Sift together the flour, semolina, baking powder and salt. In a separate bowl, whisk together the yogurt, sugar, eggs and vanilla. Whisk the dry ingredients slowly and gently into the wet ingredients. Add the olive oil and blend thoroughly. Pour the batter into the prepared pan and bake for about 25 minutes or until the cake is a light golden brown and springs back when touched or a tester comes out clean. Hull and slice the strawberries. Toss with sugar and orange zest. Set aside for about an hour to macerate, stirring every 15 minutes or so to distribute the juices. For the cream, combine the mascarpone, ricotta, sugar, vanilla, kirsch (if using) and a tiny pinch of salt. Add the heavy cream and whip until the cream shows tracks and reaches a medium peak. Refrigerate until ready to use. To assemble, trim off the edges of the cake. Cut the cake in half and spread a layer of the cream and then add a layer of strawberries. 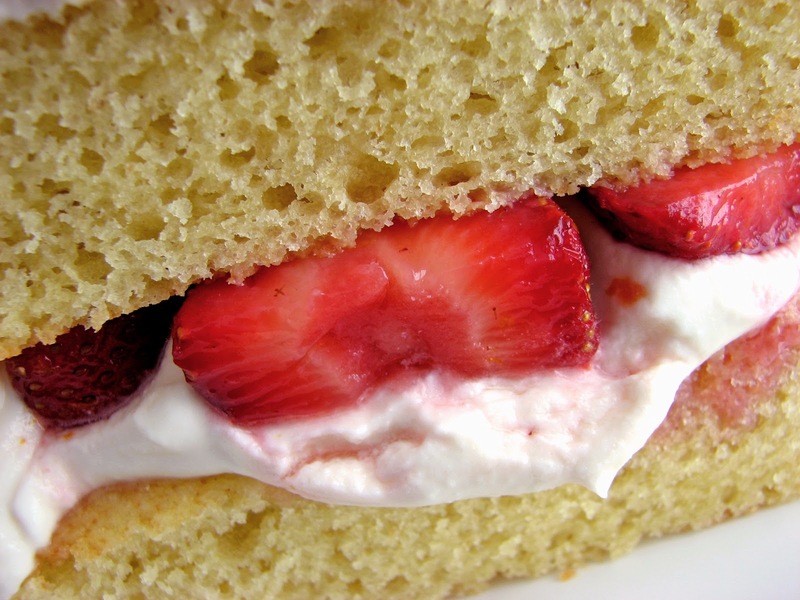 Top with the second half of the cake and finish with the remaining cream. Serve with additional strawberries and their juices. 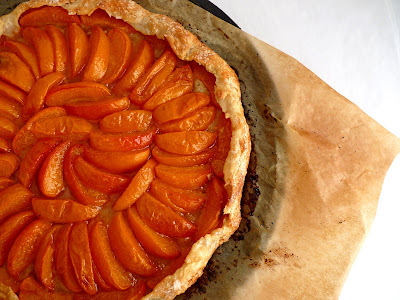 We are approaching the height of apricot season and my impulse is to make one of my favorite pastries, a very basic and rustic Apricot Galette. No complicated ingredients or components, just simple gorgeous fruit baked to such a ridiculous deliciousness that it leaves you dizzy with glee. 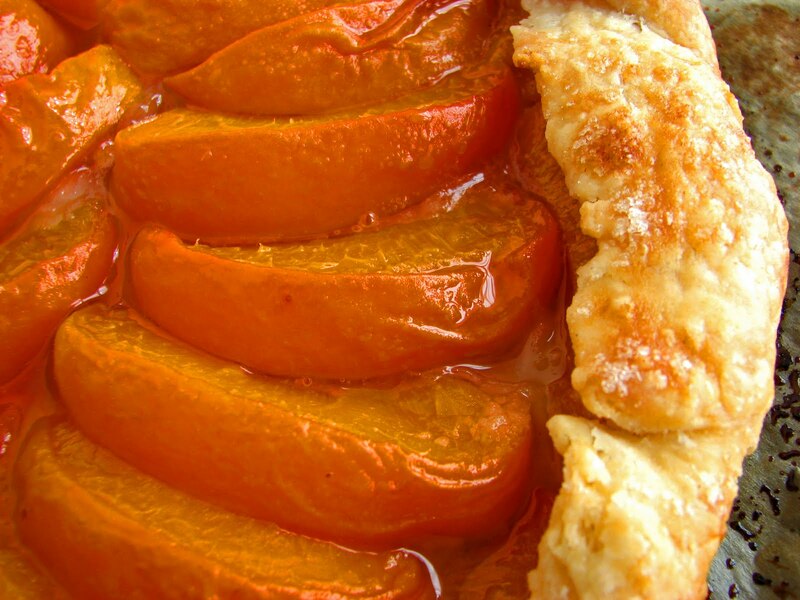 The pastry dough is buttery and bakes off flaky and crisp, perfectly cradling the magnificent apricots. This combination is just about as good as it gets. We might consider the galette the French version of American pie. Pie dough has more fat, so it’s more tender and perhaps a bit delicate to handle. Galette dough is sturdy enough to be able to form the pastry without need of a pie pan. It’s very easy to make and anyone who fears pie making can just dive into making a galette without much fear. The results make it such a perfect medium for enjoying fresh ripe fruit. The bright sunset glow of freshly baked apricots mirrors the perfect blush of nature as we head into summer. Enjoy each and every crunchy-buttery-jammy bite. 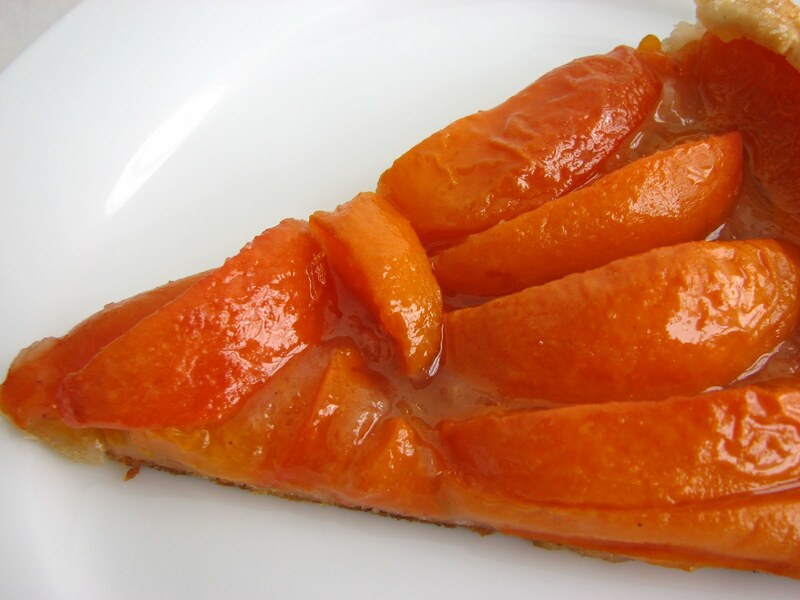 - Be sure to use ripe apricots. They should yield just a bit to a gentle touch. - This dough is handled very little in order to avoid activating the gluten in the flour, which will toughen the pastry. When you add the water to the flour mixture, you’ll wonder how it will ever become a dough, but just keep the faith. It comes together beautifully. - To finish mixing the dough, the method used is called fraisage, which is simply pressing the heel of your hand into the barely mixed dough and pushing it against the work surface to smear it. Use a bench scraper or metal spatula to scrape up the smeared dough and fold it back on itself. This is a great technique that essentially creates sheets of butter coated in flour, producing flaky layers of buttery dough. As with all pastry doughs, handle gently and be careful not to overmix. - Sprinkling the fruit with 1/4 cup of sugar seems like an ungodly amount. 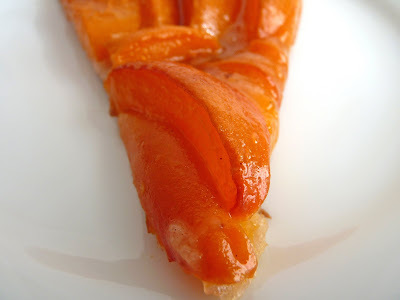 But baking apricots actually accentuates their tartness, so you do need to sweeten them up. I tend to use just under 3 tablespoons of sugar because I like them puckery, but use the 1/4 cup if you prefer them sweeter. To prepare the galette dough, whisk together the flour, sugar and salt in a bowl. Add the butter pieces and use your hands to toss together. You want to coat each piece of butter thoroughly with flour as well as your hands. Pinch each piece of butter flat between your fingers, working quickly so as not to warm the butter. Keep tossing the mixture to be sure each piece of butter is coated well with flour. Add the cold water and mix gently with a fork or your fingers until the dough just starts to come together, tossing until it just starts to loosely cohere. Gather the dough pieces on a clean work surface. Finish the dough using a motion called fraisage, which is smearing parts of the dough across the work surface with the heel of your hand. Fraisage the dough, then use a bench scraper or metal spatula to get under the smeared dough and gather and fold it back onto itself after each motion. Repeat this process again just a few times until the dough looks like it’s coming together and it feels soft, supple and not sticky. There should be small pieces of butter visible in the dough. Gently pat into a disc and wrap tightly in plastic. Chill the dough at least 30 minutes. When you are ready to roll out the dough, remove from the refrigerator and rest on a lightly floured piece of parchment paper for a few minutes so it can soften just a bit to prevent cracking. Then roll the dough out to about a 12” – 13” circle and 1/8” thickness, gently lifting and moving the dough after each roll and keeping the parchment lightly floured as needed. When you have the desired shape, brush off any excess flour and lift the parchment onto a flat pizza pan or baking sheet. Chill for about 30 minutes. Slice the apricots into 1/2” wedges. Combine 1 tablespoon of sugar with 1 tablespoon of flour and set aside. Remove the prepared galette round from the refrigerator and sprinkle the flour/sugar mixture evenly across the bottom, leaving about a 1 1/2” border uncoated. Arrange the fruit on top. Sprinkle with 1/4 cup of sugar. Lift and gather the dough edges up and on top of the fruit, being very careful not to create any cracks that will cause the galette to leak. Work with both hands, pressing gently to keep the dough in place. Chill until the oven is ready. Preheat the oven to 400 degrees. Brush the border of dough with melted butter and dust with a light sprinkle of sugar. Bake for about 30 - 40 minutes or until the dough is crisp and browned and the fruit is bubbling. Almonds in a variety of forms are a perfect match for the season’s bounty of stone fruit that is blissfully descending upon us as this gorgeous season unfolds. 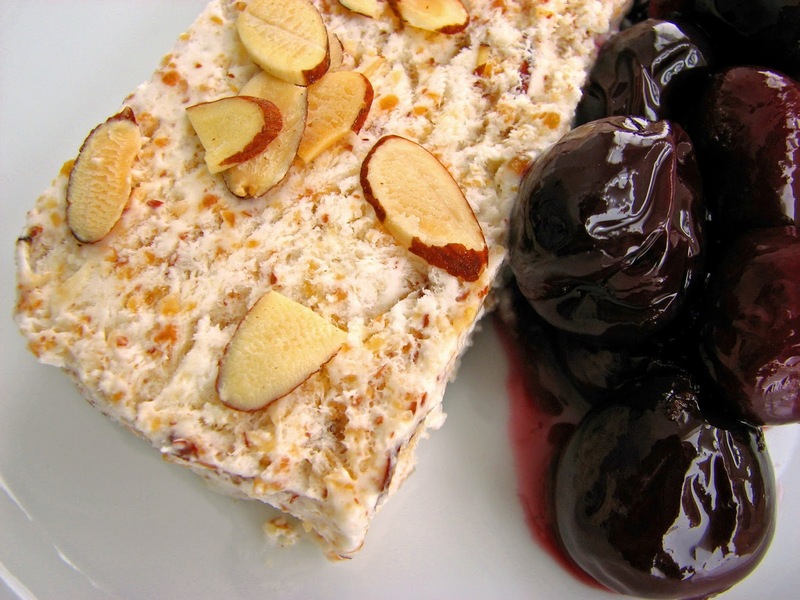 So now is a good time for a delicious pairing of almonds and cherries. 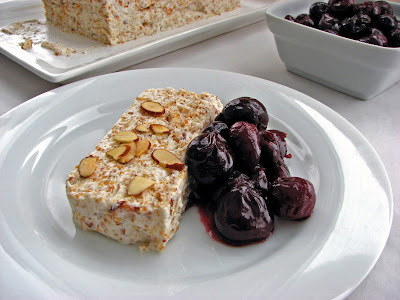 I’ve chosen a Toasted Almond Semifreddo and a bright cherry compote to highlight the kind of match that is made for the moment. 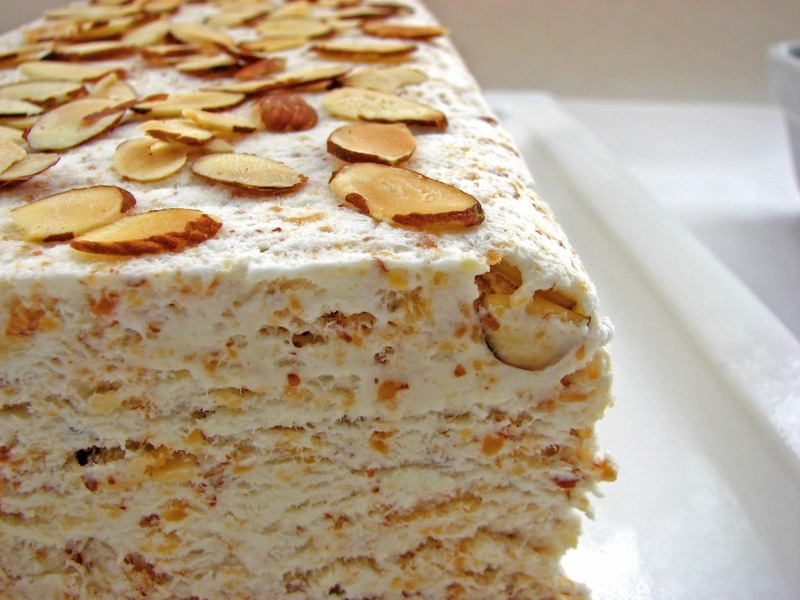 Semifreddo is the Italian term for "half cold" and is often used as the description for many kinds of partially frozen desserts. This semifreddo has a deep toasted almond flavor, a very light but creamy and luxurious texture and it’s super easy to make. Because it’s sort of half frozen, this tastes more like an airy cold mousse rather than a rich ice cream. While the semifreddo is firming up in the freezer, you can put together the cherry compote that consists simply of pitted fresh cherries, a bit of sugar, some orange zest and a bracing splash of balsamic vinegar, which lends just the right depth and spark of acidity. Do take advantage of the abundance of fresh cherries in season. Their welcome appearance invites the long and gentle days of summer. The vibrant color and delicious juices of these beautiful gems will stain our fingertips for just a few weeks, so let's get going! - When using a cherry pitter tool, be extra careful to account for all the cherry pits. Even though it does a great job of piercing the fruit, sometimes the pits stay lodged in the center, so check and be sure you can account for all of them! - When lining the loaf pan, I place a strip of parchment on top of the plastic to help create a smoother surface. If you don’t have parchment, you can use a warm knife or metal spatula to smooth out the creases. - You will get more loft if your egg whites are at room temperature. Whip the whites to a foamy soft peak first to unfold and stretch out the proteins before adding the sugar. Drizzle the sugar just a few sprinkles at a time to ensure they are stabilizing the foam. - Whip the cream just until soft peaks form. This means the cream should have a soft lilt that is droopy and barely holds its shape. If you go too far, the mixture will be grainy. The meringue should be beaten to a stiff peak, which means it should stand up when peaked without falling over. - As always, exercise caution when serving raw egg whites. - The compote should be served at room temperature to enjoy the full flavor. Add the balsamic vinegar to taste. The flavor of the balsamic can dissipate over time, so taste before serving if the compote sits overnight. If you don’t care for balsamic vinegar, add a good pinch of cinnamon instead during the cooking process. - The balsamic cherries would be good over ice cream – vanilla, chocolate, caramel come to mind – and would also be good with a cheese course. - Actually, my favorite fruit with this semifreddo is apricots that have been simmered or roasted with a bit of honey, but I couldn't find nice apricots this week. It would also taste fabulous with peaches warmed in a honey lemon syrup. 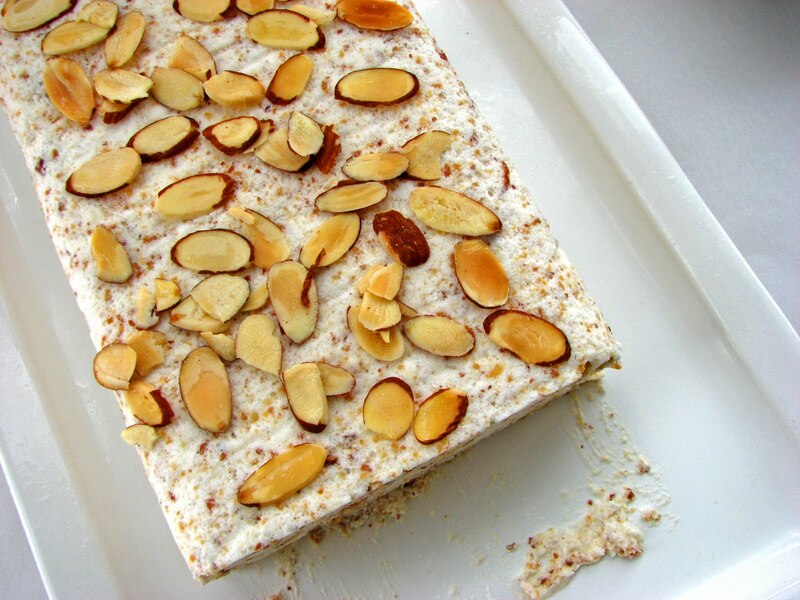 Toast the sliced almonds in a single layer in a 350 degree oven for about 6 - 8 minutes. Watch them closely as they will burn quickly. Toast the whole almonds for about 10 - 15 minutes, checking to see if they are toasting evenly and shaking the pan to redistribute them. Line an 8 1/2” x 4 1/2” loaf pan with plastic wrap, leaving an overhang on each side. You can also place a strip of parchment paper on top of the plastic to help form smoother sides. Grind 3/4 cup whole toasted almonds with 1/4 cup plus 1 tablespoon sugar and a pinch of salt in a food processor until finely ground. Pour into a bowl. Combine the 1/4 cup toasted sliced almonds with the finely ground almond mix. Beat the egg whites until they are opaque and hold soft peaks. Add remaining 3 tablespoons sugar just a little bit at a time, increasing speed to high. Beat until meringue holds stiff, glossy peaks. Whip the chilled cream with almond and vanilla extracts just until it holds soft peaks. Using a rubber spatula, gently fold meringue into the whipped cream. Fold in nut mixture gently until there are no white streaks. Pour into the prepared 8 1/2” x 4 1/2” loaf pan. Smooth the top until it’s level. Cover with the overhanging plastic wrap and place in your freezer until firm, about 8 hours or overnight. To make the cherry compote, place the pitted cherries with the water and sugar in a saucepan. Add the orange zest and simmer until the juices are rendered and the cherries are fairly tender, tasting for the right amount of sugar. Remove from heat and add the balsamic vinegar. Cool completely. Run a thin knife or small metal spatula around the edges of the semifreddo to loosen. Lift gently out of the pan using the plastic overhang. Place a serving plate on top of the pan and invert. Carefully pull off the pan, plastic wrap and parchment if you used it. Garnish with toasted almonds. Slice with a sharp knife. Garnish with balsamic cherries and serve immediately. Every pastry chef follows their own unique road when it comes to developing their palate and style. In addition to the esteemed and very exciting position in the White House, Chef Yosses has had an amazing professional life working with some of the best chefs and restaurateurs in the business. He writes warmly about his memories and associations in the culinary world, which come from a distinguished career at places like Citarella, Bouley Restaurant and Bakery and a great deal of work in Europe with grand chefs like Pierre Hermé and Robert Linxe. All of these experiences surely contributed to Chef Yosses’ love of the art of pastry so plainly evident in all of his recipes. This is an enjoyable read. The Perfect Finish is nicely laid out with lots of gorgeous full-page photos and a few process pictures to help explain technique. It contains 80 recipes separated into categories based on occasion and style. There’s “Come for Brunch” with muffins, tea breads and scones. My own particular heart beats for the Crème Fraiche Pancakes. “Pick-me-ups” is about irresistible cookies and snack items. “Straight from the Oven” presents homestyle cobblers and pie. The section on “I’ll Bring Dessert” is full of luscious jewels you can easily transport. A chapter on “Restaurant Desserts You Can Make at Home” provides the details and courage for home bakers to delve into more style and sophistication with items like his version of Îles Flottante in a spiced crème anglaise and Warm Molten Vanilla Cakes. Chef Yosses’ flair for fun and flavor is showcased in the chapter on “Birthday and Celebration Cakes.” The section on “Holiday Desserts” gives us a broad display of cookies, trifles, toffees and tarts. There is plenty of festivity throughout. His focus on technique, storage and transport will appeal to the novice and experienced baker alike. And what’s tremendously useful is not only does he give good explanations of basic equipment for a well-stocked kitchen, he also provides links and phone numbers for every unusual ingredient sprinkled throughout the book. So there are no stumbling blocks to engaging with his joy for unique flavor and beautiful presentation. I also love that he gives recipe measurements in volume, ounces and grams so you can choose whichever mode you’re most comfortable with in your own kitchen. This handsome book is the work of an accomplished man with a very generous spirit. Chef Yosses perfectly illustrates the pleasure of creating and serving beautiful pastry. His vibrant personality shines through on just about every page and I find a certain elegance in everything he does. I look forward to working my way through each section. To begin, in his introduction he expresses a wish for his readers to use the book in such a way that invites lots of smudges, spills and stains on its 273 pages. Although I usually do my best to protect my cookbooks, I join him in the sentiment! - You can grab a sneak peek of The Perfect Finish at Scribd. - As Chef Yosses reminds us, have all your ingredients at the ready before you begin preparation of any pastry or dessert. I heartily join him in that refrain. If there’s any piece of advice you’re willing to take from a pastry chef, it’s always, always, always measure out all your ingredients before jumping into mixing. This is what is known as mise en place and makes for a much more enjoyable journey. 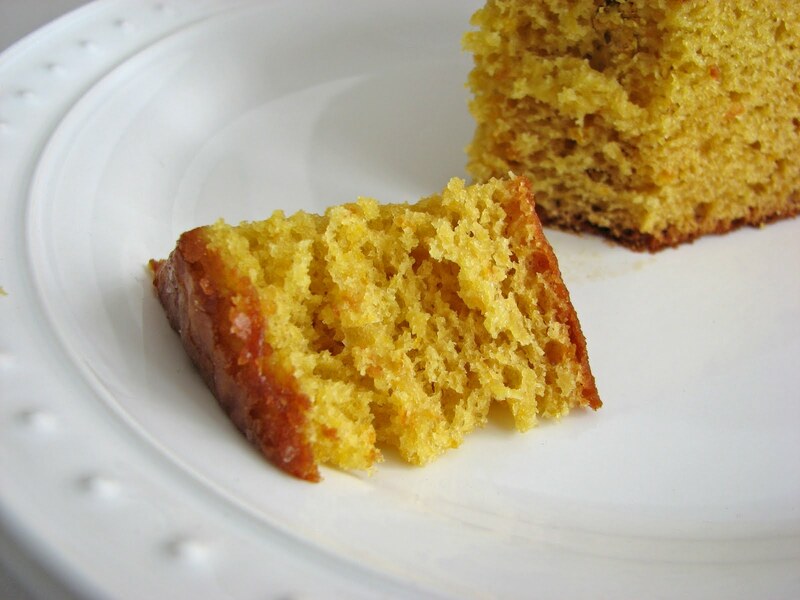 - This cake has a gorgeous aroma, a moist spongy texture and lots of orange flavor. I especially love the playful addition of fleur de sel, which creates a nice bling of flirtation to light up your palate. - This is a lot of cake. I made half the recipe in a 9” x 2 1/2” pan, baked for 30 to 35 minutes, and served 8. I used the full recipe for the orange glaze. Bring 3 quarts of water to a boil. Slice the tops and bottoms off the oranges and quarter them. Place the oranges in the water and bring to a boil. Remove the oranges and repeat this process twice again to remove any bitterness from the orange peel. Once you complete that process, drain the oranges and place them in a pot with 1 quart of fresh water and 1 C sugar. Bring to a boil to dissolve the sugar. Turn down the heat and simmer for about 30 minutes or so until the fruit can be easily pierced with a fork. Preheat the oven at 350 degrees. Grease a 10” x 2 1/2" round cake pan. Drain the oranges from the cooking syrup and cut into chunks, removing any seeds. Place the orange chunks in a food processor and pulse until you have a chunky puree. Add the eggs, 1 1/3 C sugar, the sifted flour mixture and the vanilla to the processor and blend. Add the olive oil last and pulse until thoroughly mixed. Pour the batter into the prepared pan and bake for about 40 – 50 minutes or until a tester comes out clean and the cake is golden brown. Cool in the pan for 10 minutes. Run a thin knife or spatula around the sides of the pan and turn the cake out on a plate. Turn the cake over again so it is right side up. Cool on a wire rack for at least another 30 to 40 minutes. For the glaze, place the orange juice and sugar in a saucepan. Simmer over low heat until the sugar is dissolved. 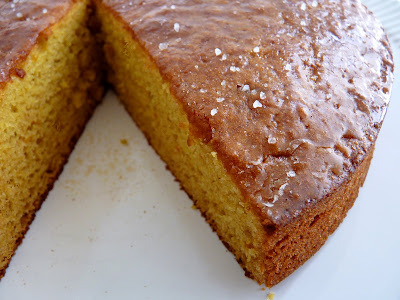 Pour the glaze over the cake and sprinkle with fleur de sel. Pastry Studio: Chef Yosses, congratulations on the release of your beautiful new cookbook! It's brimming with personality and elegance. I'm enjoying reading about your background and am wondering how you first conceived of the content and style. Did you have the concept ruminating on the back burner for quite awhile and did that change over time or was it a matter of choosing your favorite recipes and developing the book from there? How long did the process take from start to (perfect!) finish? Chef Yosses: I thought of the way I decide to make a dessert at home and what steps I take to get it done. Usually it is for a particular event, occasion or reason, even a casual dinner, so I decided to shape the book along those lines. For the content, I chose the recipes that I loved the most or that were a happy surprise when I discovered them. I hope the readers will find that, too. The process was interrupted several times and took about 4 years to complete. Pastry Studio: How has the White House garden changed your approach to producing pastry for the White House? I know you likely have always had access to the best ingredients but is it different having a garden in your midst? Chef Yosses: I have been working from a farmers market or a garden for a while, especially at the Dressing Room, the restaurant started by Michel Nischan and Paul Newman. That is where the food was made almost exclusively from local purveyors and farmers. To have a garden right outside the kitchen is an awfully nice convenience and I use it constantly. I love watering the garden, it does as much for me as it does for the garden. Pastry Studio: You have the great privilege of creating terrific pastry and desserts for so many influential people. But if you could create a pastry or dessert as a gift for someone new, who would that be and what would you produce? Chef Yosses: I think one of the most difficult things to do is to choose the perfect gift for someone, and some people are really geniuses at it. To chose something appropriate, personal, unique that only the recipient can appreciate takes a lot of thought, and it is an exercise I admire greatly. So if by "someone new" you mean someone I don’t know I would first try to get to know a little bit about that person and tailor the dessert to them. I do love working with seasonal fruits and using as little sweetener as possible (that does not mean the dessert can be sour or too tangy, however). Adding layers of flavor is another stylistic element that I love, so that the sweet part can be multi-faceted from honey, agave, maple, or herbal. Since the person is someone new I would make the dessert as simple as possible to appeal to a wider range of audiences. So as specific as I can get is - a small fruit dessert with impeccable lines in a simple pattern with complex layering of flavor. Thanks to Chef Yosses and congratulations on the release of The Perfect Finish.